A prong setting, sometimes called a claw setting, is the most commonly used gemstone setting and is especially popular for solitaire engagement rings. Prong settings, when done correctly, are ideal for holding large stones snugly in place. However, this type of setting is not for everyone. Find out if it is the right choice for you. You've likely seen prong settings before: a diamond or gem is inserted into three or more metal prongs that form a basket-like base. Then, the ends of the prongs are bent over and shaped around the stone. This creates a cradle where the top of the prong rests against the crown of the stone. The visible prong ends are often rounded, but they can be shaped into ovals, points, Vs, left flat, or even formed into decorative prongs. A prong setting can be tall, perching the diamond well above the ring's band, or it can be short where the stone rests closer to your finger. Prongs don't take up a lot of space, so more of the gemstone is visible. These settings are fairly quick to create, so they are usually less expensive than more intricate settings. And, stones set in prongs are usually easier to clean. You should be able to get a small brush into the sides of a prong setting to more thoroughly clean the bottom and sides of the stone. The girdle area of the gemstone is not covered, so prong settings offer less protection for the gem than other, more enclosed settings such as a bezel setting. One wrong blow against a hard surface and you could easily crack your diamond or gemstone. Some prongs have a tendency to snag clothing and other items they touch, especially if they aren't well positioned on the stone. Someone who has (or plans to have) children probably should not wear a tall prong setting that could scratch or puncture delicate skin with the wrong wave of a hand. The gemstone should be held snugly by the prongs so that it has no chance to wobble around. Check to make sure the stone is secure by gently moving your fingernail along the girdle of the stone. If the stone stays in place, the stone is likely secure. You can also shake the ring gently near your ear to see if you hear any rattling. 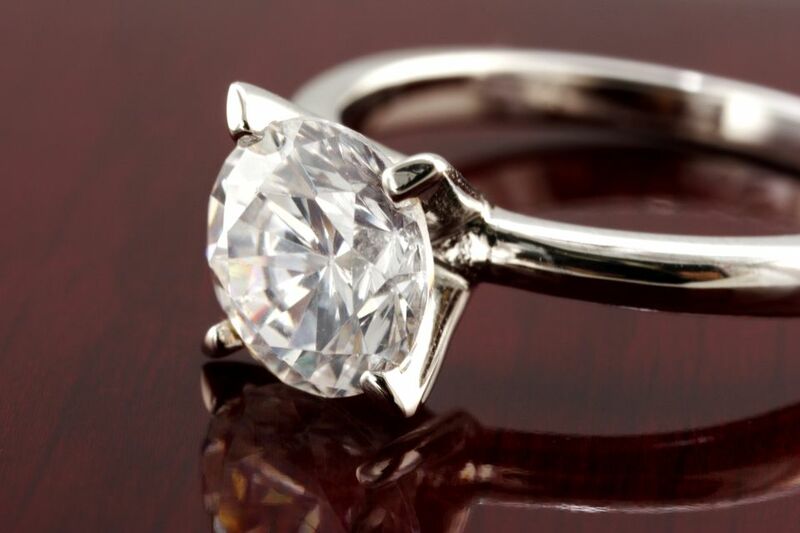 Prongs should be formed so that the stone sits at an even height, not up or down on any side. The table of the stone should be level and not slanted. Very thin, flat prongs can eventually break or wear away, putting the gemstone at risk. Be careful when purchasing antique jewelry that may have weakened prongs. Hooked prongs, where the prong end forms an open loop before it touches the stone, are at high risk for eventually opening up. Avoid this prong type at all costs. Short prongs that do not offer enough contact with the gemstone may not hold it safely in place and are more likely to catch on clothing and other items. All it takes is catching a sweater thread on the edge of a short prong one time to pull the prong back completely; this can compromise your stone. Prongs that are too large in proportion to the gemstone can overpower the piece, making the setting less attractive. V-shaped prongs offer protection for pointed edges of gemstones, such as the ones you'll see on heart- and pear-shaped gems.